There’s a lot to unpack here, so hang tight, and let’s jump in! Moore’s Law (or the exponential growth of integrated circuits) is actually referring to the fifth paradigm of computation. Here’s the list of the underlying technologies: (1) Electromechanical; (2) Vacuum Tube; (3) Relay; (4) Transistors; and (5) Integrated Circuits. Quantum computers may well be the sixth paradigm, given that they work in a fashion that is entirely different from “classical” computers. In contrast, a quantum computer uses “quantum bits,” or “qubits.” Thanks to a principle called quantum superposition, these qubits can have a value of “0”, “1,” or both “0 AND 1” at the same time. This capability allows quantum computers to solve certain types of complex problems that are intractable for conventional computers. Frankly, really exciting problems for society today, as you’ll see below. The power of qubits is that they scale exponentially. A two-qubit machine allows you to do four calculations at once. A three-qubit machine can do eight calculations. A four-qubit machine gives you 16 calculations, all simultaneously. By the time you get to 300 qubits, you’ve got a computer that can do more “calculations” than there are atoms in the universe. What Are the Implications of Quantum Computing? The implications of true quantum computing at scale are staggering, of extraordinary impact to society today (which is why I’m tracking it). Machine Learning: Much of machine learning is about “pattern recognition.” Algorithms crunch large datasets to find signals in the noise, and the goal is to maximize the number of comparisons you make between data to find the best models to describe that data. With quantum computing, we’ll be able to do this processing orders of magnitude more effectively than with classical computing. Quantum computing will allow you to compare much, much more data in parallel, simultaneously, and all permutations of that data, to discover the best patterns that describe it. This will lead to fundamentally more powerful forms of AI much more quickly than we expect. Expect quantum computing to cause a positive inflection point (upward) for the speed at which the world develops AI (which, by the way, is why Google is working so hard on it). Medicine: Quantum computing will also allow us to model complex molecular interactions at an atomic level. This will be particularly important for medical research and drug discovery. Soon, we’ll be able to model all 20,000+ proteins encoded in the human genome and start to simulate their interactions with models of existing drugs or new drugs that haven’t been invented yet. Based on the analysis of these drug interactions, we’ll be able to find cures for previously incurable diseases and hopefully accelerate the time to market for new drugs. Using quantum computer simulations will be the way we design and choose our next generations of drugs and cancer cures. Chemistry (and Climate Change): Worried about the climate crisis? Wondering what we can do about it? Quantum computers may be our newest tool to understand what is going on and to fight it. They will allow us to unlock “simulation-driven” solutions, perhaps design new catalysts that actually capture carbon from the atmosphere and turn it into new and valuable products at low cost and energy use. Biomimetics, Energy Systems & Photovoltaics: Scientists believe that much of the world is built atop quantum systems. Processes like photosynthesis, for example, are likely dependent on quantum mechanical systems. Thus, as we look to the natural world for inspiration to build better energy systems or stronger materials, we’ll only fully realize their potential when we can model these processes with quantum computers. This will lead to many advances and discoveries across the board. Bottom Line: When quantum computing pans out, we’ll be able to control the very building blocks of the universe. Who’s Working on Quantum Computing? Quantum supremacy is essentially the test that validates that the computer you have is, in fact, a quantum computer. Both Rigetti Computing and Google believe they will reach “quantum supremacy” in the next 12 to 18 months. The revolution is coming fast. To put this into perspective, I had a chance to catch up with Chad Rigetti, the CEO of Rigetti Computing. 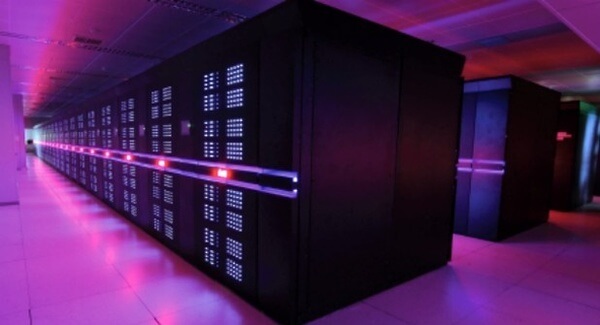 Below is a picture of the most powerful ‘classical’ computer on the planet, Tianhe-2 in Guangzhou, China. The computer burns about 20 megawatts of electricity — enough to power 20,000 households. And it’s about half the size of a football field, with 3.2 million Intel cores. President Obama, in the attempt to drive America’s return to high-performance computing supremacy, declared that the U.S. would build an exoscale computer, 30x more powerful than Tianhe-2, by 2020. The problem is this: With current technology, it will cost a billion dollars and will require a nuclear power plant to run the supercomputer. Below is a picture of two developmental systems in Rigetti’s lab in Berkeley, CA. The big white cans about the size of a human are cooling systems, and inside each cooling system is a single quantum chip. In these machines today, there is a five-qubit processor. This is what quantum computing unlocks. Rigetti is rapidly developing quantum integrated circuits and the software platform that will allow developers to build on top of them. Along with efforts at Google, IBM, D-Wave, and many other companies and research labs around the world, we are rapidly approaching a quantum computing revolution.